Everyone has heard of the term, "The Midas Touch". If I am given a chance to describe in just three words, the whole of Smriti Mandhana's relatively-short career so far, the above description will be my best and only choice, as I fail to see what else could do the job better. The only second Indian cricketer (among both men and women) to feature in a foreign international T20 league, owner of a World Cup century, owner of a double ton in domestic one-day competition - all before the age of 20, and you will understand the kind of skill and talent that the young player has shown so far. To be there among the top-15 run-getteres in her debut World Cup tournament, scoring a fifty on her Test debut - her list of achievements keeps getting bigger and better. And just like for every other Indian who has sat up and taken note of this bright prospect, her way of playing has also attracted the cricketing fraternity from foreign countries, as well as the common masses over there. So much so that she recently became the second Indian only (after co-batswoman Harmanpreet Kaur) to feature in the WBBL, a women's version of the reputed Australian Big Bash. And she has since lit up the skies Down Under as well. Post the 2017 World Cup, the Indian Women barely had any action in the next six months but after the hiatus they played back-to-back series against the likes of England and Australia at home and South Africa in their territory. And it was as if the girls forgot their cricket as they were humbled by the Aussies, almost humiliated by the English and then barely scraped through to win the South African series. Among the cloudy performances of others was Smriti Mandhana who continued to shine bright, as she racked up the runs as if nothing had changed. 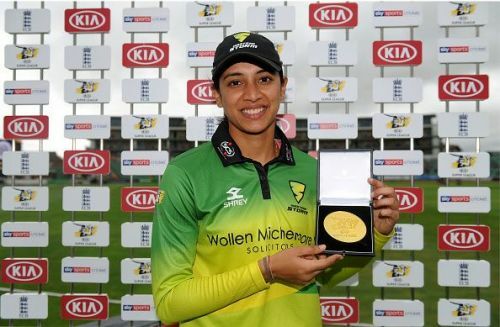 It was this that paved way to her entry into the Kia Super League (KSL), a women's-only T20 tournament organized by the England and Wales Cricket Board (ECB) on par with the more popular all-male event, The Vitality T20 Blast. On June 13th, Smriti was signed up for play in the 2018 season of the KSL, and she has not looked back. Her first game was also the Storms' first game in the 2018 KSL, and they were up against Yorkshire Diamonds, who assigned them a beefy target of 163 to chase in 20 overs. 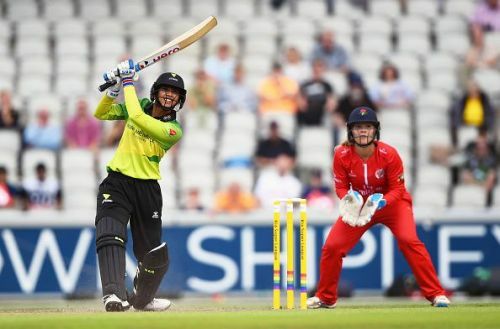 Though Heather Knight played the all-important knock of 97 runs, it was Mandhana's exploits at the top that gave Knight plenty of time to chase the score, after the team showed signs of downfall at 0/1 in 0.1 overs itself. Smriti cracked a 20-ball-48, including 3 fours and 5 sixes, and by the time she departed at 7.5 overs, the Storms had crossed half the required score, giving Knight ample time to do the rest. In the next game against Surrey, the Storms were put to bat first and all they could manage in 20 overs were 132 runs, which would not have been possible had Smriti (37, 21b, 3fours, 2sixes) not done what she usually does. That game was the only game that her team has lost in the season so far. The third game came three days later and the conditions this time were even more drastic, as the Indian opener had to do her maximum in a rain-induced-time span of 6 overs per side. With a 19-ball-52 including 5 fours and 4 maximums, she proved how worthy a player she is. 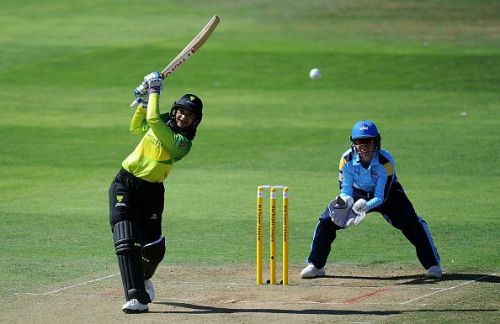 The fastest-ever-fifty in the KSL and in women's international cricket, fetched her the first Player-of-the-Game award this season, as the Storms won the contest against Loughborough Lightning by 18 runs. By now, she was also competing for an individual accolade, apart from overall glory with and for her side. The southpaw was among the top rungs of the Orange-Cap ladder, along with Heather Knight and Sophie Devine in terms of the runs scored in the KSL 2018. This was before her fourth game, where she played yet another match-winning knock after the Storms' bowlers put in a thorough performance to dismantle the Southern Vipers at just 91 runs. Smriti scored a 43 off just 27 balls, and remained on the crease until she helped see off the target. With 180 runs in 4 innings at an average of 90, she thus emerged the lone leader in the Orange-Cap race, leaving her opponents far behind. And she didn't stop there, as it was evident just a couple of days later. That was her best innings so far in the KSL 2018, as she helped overcome a 154-run target set by compatriot Harmanpreet Kaur's Lancashire Thunder, with a quick century. The queen blitzed her way to a 60-ball-102, before getting dismissed in her next ball with just two more runs to win. The 12 fours and 4 sixes smashed by her, had however, done all the damage by then and there was no looking back for her side. 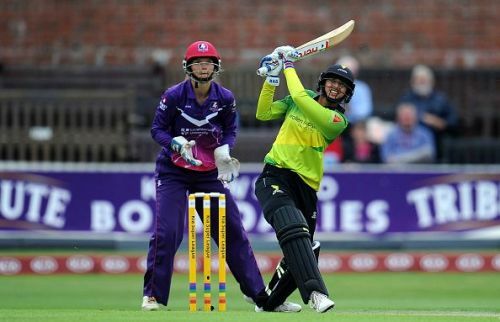 S he has repeated her onslaught yet again - versus Yorkshire Diamonds that first faced her back on July 22. 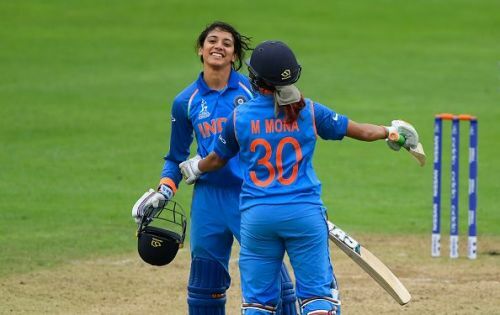 This time the target was higher, at 173, and in a game where all the Storms' batswomen clicked well for the first time this tournament, she also contributed with a 56 (36b, 5fours, 3sixes), and the Storms won their fourth game in a row, amounting overall to five wins and a loss in the tournament so far. They stand second in the table only to the Loughborough Lightning with a 0.1 net run-rate difference. As mentioned above, the Storms have won four straight games in a row, and you have no special points for guessing the best player on all those four occasions. With a combined tally of 338 runs from 6 games at an average of 84.50, Smriti has eclipsed the rest of the competition with the second-best player Lauren Winfield of Yorkshire still at 181 from 5 innings. All this at a monstrous strike rate of 183.70, including 34 fours and 19 biggies - it is not hard to see why we're saying that she is having the run of her life. What adds to the joy is the factor that the Indian girls will be leaving for the Caribbean in October, so as to play in the ICC Women's T20I World Cup, and having Smriti in the squad will be a huge bonus for the side, also considering the fact that she has racked up all these runs against players she will be facing on that stage as well.